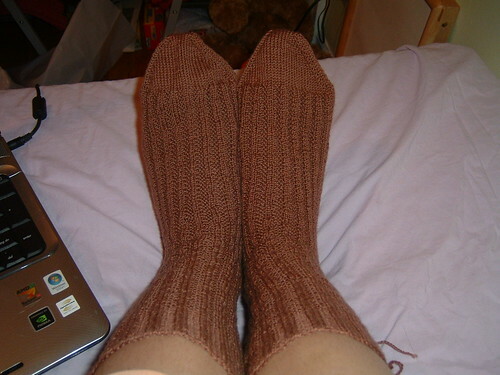 Hubby’s Anniversary Socks, originally uploaded by Craftydiddl. i finished the grafting of the toe last night-knitting was finished on Saturday nite but since hubby had the weekend off i had to little time to knit in secret. I am really happy with the way these turned out and i hope he likes them and that they fit. They are a very basic pattern and from what i have seen onine and Ravelry a very popular pattern. I didn’t have any problems after i restarted with less stitches and got help with the heel. Yarn:Louet Gems in Sandalwood-just a tad over 2 skeins for 11 1/4 inches size feet on size 2 needles. I will let you know how they are received-Tomorrow is Anniversary day-He better like them!!!!! I started My So Called Scarf and i really like how it’s turning out with the Ironstone yarn. I finished the sewing my Robot friend but he still needs eyes, mouth and his control panel. i will have a pic tomorrow with eyes and mouth but control panel won’t be done right away. I am not sure what kind of panal i want to give him. I am going to make that scarf for a swap I am in! Your husband is going to love the socks. They are wonderful!